Everything you need to know about installing and maintaining your smoke alarms. Most smoke alarms and detectors are fitted with a button marked “test.” Push this button once a month to ensure that the batteries are still operational. The sound will be loud so be sure to prepare the other members of your family beforehand. It’s important that everyone in the family knows the sound of the alarm and knows what to do in the event of a fire. Have someone stand far away from the alarm to ensure it can still be heard inside the house. If you push the button and no sound comes out, it’s time to replace the batteries. Once you’ve determined that the alarm is working, you’ll want to test the smoke detector. For this, you can light several matches at once or you can use a product like a smoke detector test aerosol spray can (be sure to look for one that is UL listed). This spray helps determine if your detector is actually registering smoke particles. You’ll also want to test this once a month. page recommends that homes have both types of detectors. This recent Good Morning America investigation illustrates just how different these two different alarm systems actually work to detect various types of fires. Some detectors are dual systems and use both types of technology, however, you can also elect to install both types next to each other. Your smoke alarm may be marked simply with an “I” or a “P” to indicate which type you have. 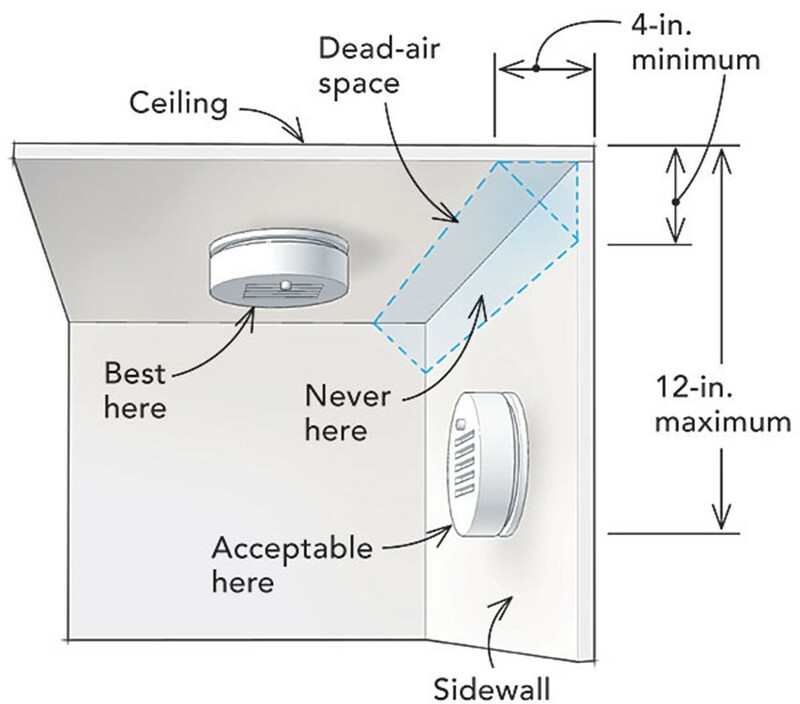 Your local building codes have established laws and regulations for smoke detector placement but if you aren’t sure where to install your smoke detectors, here are some general guidelines. Smoke detectors should be placed on the ceiling or high on the wall if the ceiling is too difficult to reach. Place at least one detector on each level of the home. You’ll also need one in every bedroom and one in the main corridor outside the sleeping areas. Don’t place a smoke alarm too close to a stove or shower as steam may set off the alarm. Also, don’t place a detector too close to a fan or vent as the air current may remove the smoke and not set the alarm off. For a full list of specific installation placement for the home, refer to the NFPA recommended guidelines here. Image courtesy of Town of Brighton. A connected smoke detector system means that when one alarm sounds, they all sound. Some detectors even have a voice prompt that alerts the homeowners to which alarm was set off first. A connected system may be very important for homes that are large but can be a good idea in smaller homes as well. Smoke detectors can be purchased individually and may be battery operated or hardwired to the home’s electrical system. In the event of a power outage, a hardwired smoke detector is fitted with a back-up battery system that will still need to be tested and replaced regularly. Newer homes are often built with hardwired alarms. Hardwired systems should be installed by a licensed electrician. If you have a battery operated alarm, the batteries should be replaced every 6 months (try doing it on easy-to-remember dates like Daylight Savings or New Year’s Day and 4th of July). Smoke detectors should be replaced every 10 years from the date of manufacturing (the date should be indicated on the device). Dust and debris can settle inside the device and the sensors may not work as well after the 10-year period. You should also replace any alarms that come with the house unless the manufacturing date can be proven. Some smoke detectors are fitted with additional features like flood lights. Smoke is actually dark in color, so a flood light may sound like a good idea, but some experts believe that the flood light may simply not work as well as simply holding a flashlight. Another new feature you may find are combination voice and beeping alarm systems. Voice warning features or custom voice features (like an alarm that can be pre-programmed with your own voice) may be a good idea if there are children in the house; studies have shown that children respond quicker to a voice rather than a beeping noise. Another feature is a quick shut off button which can come in handy if your smoke alarm is regularly set off by your cooking, or a sealed battery feature. The advantage of these features is that some homeowners, annoyed by false alarms, simply remove the batteries or disarm the system, which is a terrible idea. Another new smoke detector feature is one that alerts your phone when the alarm is triggered. This can be a great idea if you are away from home, on vacation, or simply want greater peace of mind. These devices are offered as a plug-in version or you can speak with a company that offers whole-home security and monitoring systems. There are also alarm systems designed for people who are deaf or hard of hearing. “While 96% of American homes have at least one smoke alarm, no smoke alarms were present or none operated in two out of five (41%) of the reported home fires between 2003-2006. Almost two-thirds of home fire deaths resulted from fires in homes with no smoke alarms or no working smoke alarms.” This alarming statement by the NFPA confirms the statistics regarding house fires and the value of having an early warning system like a smoke detector and alarm. But you must also be sure to take responsibility and regularly test these alarms, replace the batteries, and make sure your family has a fire escape plan. Read more about carbon monoxide safety here. Related: What Fire Extinguisher Should I Buy For My Home? Earthquakes: Is Your Home Ready For The Big One? Should You Hire a Surveyor or DIY?